One of the projects I had wanted done was to have the path to the front door moved. To get to the front door before you had to walk up the drive way and then in front of the flower garden. Very uninteresting and made for a ho-hum look to the property. I wanted the path done in tumbled stone but we could not afford that so utilized the paving stones we owned. Richard curved the path as you see here in the picture. We found the bamboo fence type product in the Dollar Store and added that along the edge, plus white rock in the gaps the paving stones left when curved, we also utilized old brick that we either dug up or rescued from the company that handled the safety issue of our chimneys after they caped them off. On the left side besides the two red wood dogwood shrubs we have added two nine bark shrubs which have burgundy coloured leaves (see picture below), these will be a nice contrast to the green dogwood and white house. Also on the leftside are Day lilies, Liatris and Tiger lilies. We have a small garden in front which off sets the path which I like. We pruned the apple and crab apple tree and the saskatoon bushes, plus cut down the front hedge and will decide later what we ultimately will do there, whether remove the hedge completely and build a small picket fence or let the hedge grow and keep it within two to two and half feet tall. After the hedge was cut down we were left with a bare piece of ground that had been covered by a very thick hedge. Richard had a great idea to plant one of those wild flower mixes in the area and this is what we ended up with. We are really hoping that the poppies and bachelor buttons will reseed themselves. We had a ton of people stop and complement us on how pretty that part of the garden looked this year. This is how the back, front corner looked with the hedge down and pond completed. This winter someone has very kindly knocked out that far end of our fence. We added three different types of blueberry bushes this year next to the saskatoon shrubs. I never really know what to do with this weeping cherry tree but each year it appears to thrive even though I don't know what I am doing with the pruning. I discovered that the old Virginia creeper has revived this year and at this point in time I have been keeping them separated from the hops. Hops are like a weed and it just takes over that whole corner of our garden. Richard loves them and they do start from the ground every year and make that corner of the garden very green. This was my surprise gift from Richard, I fell in love with a similar one the previous year and Richard found the identical one this past summer. The only problem we had was with yellow jackets, we never did find the nest but did find a solution using a wasp trap. I am glad we took the summer to stay home having a late vacation. It gave us lots of time to work in and enjoy our garden. We finished the front path, had fish in the ponds and got to enjoy all our new lilies, plants and shrubs. This is the first summer that we have chosen to stay home all summer, work on our yard and actually watch our garden grow keeping the weeds under control. I so enjoyed Lynda's lilies last year, while we visited with her, that I decided we would order lilies for our front garden. At the end of last summer once again I dug everything up in the front flower bed, I moved all the delphiniums to the back of the bed against the house, then I placed the Monkshood in front of those and a row of Tiger Lilies in front of all that. We knew the Delphiniums would bloom first, then the Monkshood and then the Tiger Lilies doing this left a large section of garden to plant plus where the path to the front door had been. We did have a day lily in the corner by the step, then a primula (the flowers had never really fully opened up) which I am reluctant to dig up. The chives, white Speedwell (Veronica) and purple Speedwell were well established so I left them where they were and added a Columbine to the mix. I ordered three new small day lily plants which were planted in the fall just before the ground froze. In the spring we discussed what to purchase from Vesey's plant catalogue. They had a really great deal on for spring; purchase $200 worth of plants and get $100 credit. Because I wanted to add different lilies to the garden I purchased a mixture of early Asiatic lilies; mid to late blooming Oriental lilies and a few different day lilies. We added to the mix, Liatris (Blazing Star), King Kong Poppies, Sea Holly; Bell Flower and a few other plants. Although we marked where each bulb was placed we did not draw a sketch in order to know what would come up where and when they would bloom, so there has been confusion as to the names of plants, what did not grow and why certain mixtures appeared to be all the same colour and definitely not what we had ordered. You will see what I mean from the pictures. 'Exploding Pumpkin' Day-lily specifically purchased one plant and got one flower only. This is the last of the new lilies that we planted, the 'Majestic Hue' was a specific purchase. The majority of the day lilies did not bloom this year which was very disappointing. For a first year though I think we had some lovely colours although not as good a mixture as we had hoped for. Everything else that was already in the garden did fairly well and some we will have to move as they have grown so big and are now crowding out each other. We shall leave the Delphiniums where they are, they ended up covered in mites of some sort and had to be cut down to the ground, but they had finished for the year. The Tiger lilies were the best they have been in the past three years. Rather than just talk about the flowers let me show you. Poppy and Liatris are new this year. Basically that is my front garden but I have more plants in the yard in various areas. I will post in another blog. We added a lot this year and wanted to be home to see the results of our labour and complete other projects outside. Renovations; On hold... sort of. Not the best title but really there is not much more to report. We mapped out all the electrical and what additional receptacles we need. We have discussed the layout of the kitchen. The bathroom is smaller than we realized because we want to retain the original fireplace and that takes up the majority of one side. We have a window that fills another side. Then of course there is the doorway on the third wall and radiator on the last wall. The plan now is to get quotes from a general contractor, electrician and plumber, that is the holdup. Richard is supposed to be phoning various individuals that we have obtained the names for, but it does not appear to be a high priority on his list. He did phone the plumber but has not heard back from him. In the mean time we are working outside in the garden... but that is another blog, for another day. Today Richard took down the last pieces of framing for the dropped ceiling in the bathroom. We originally were only going to work on one room at a time until we discovered that our home still has live knob and tube wiring which means we have to rewire the house. 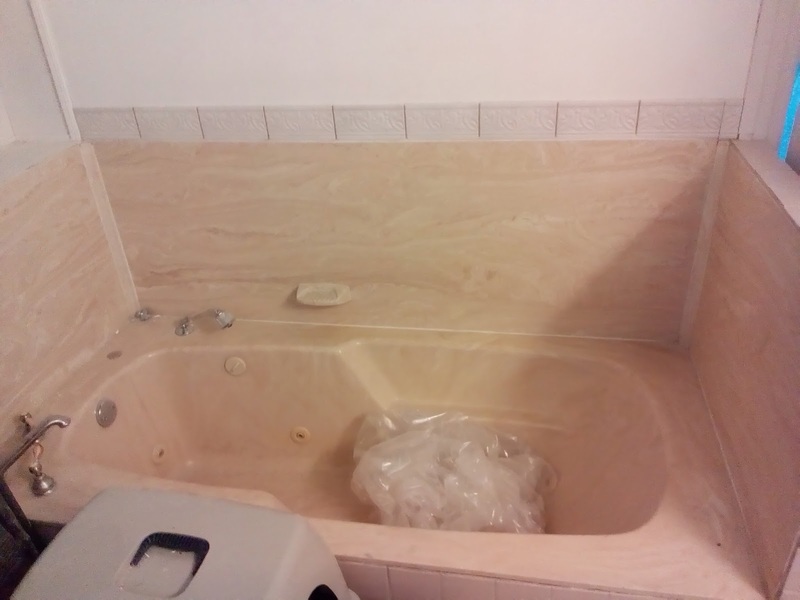 I posted pictures of where we were with the kitchen so these are pictures of the bathroom. 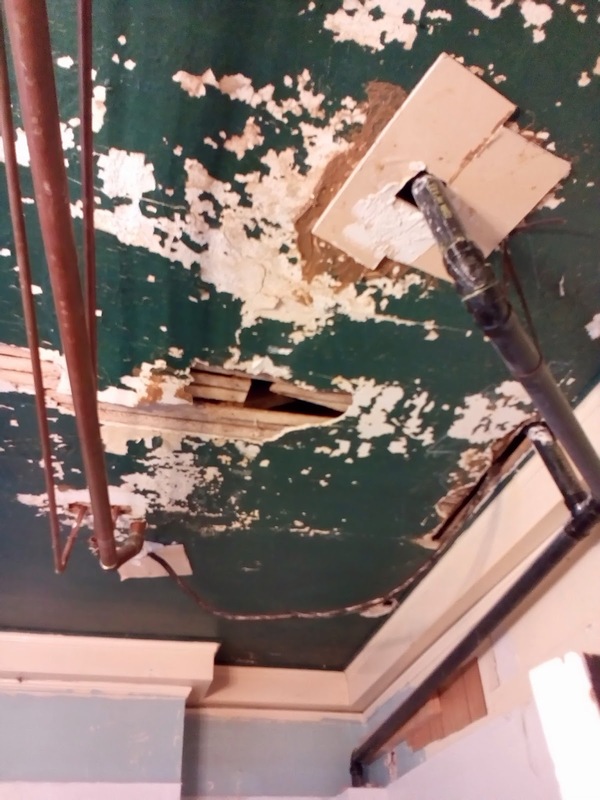 As you can see the original ceiling is a mess. I want to save the moldings around the ceiling edge and strip the paint from them so they match the hallway and the living room moldings. A lot of work to be done, we need to have access to the wiring to remove and replace t all. 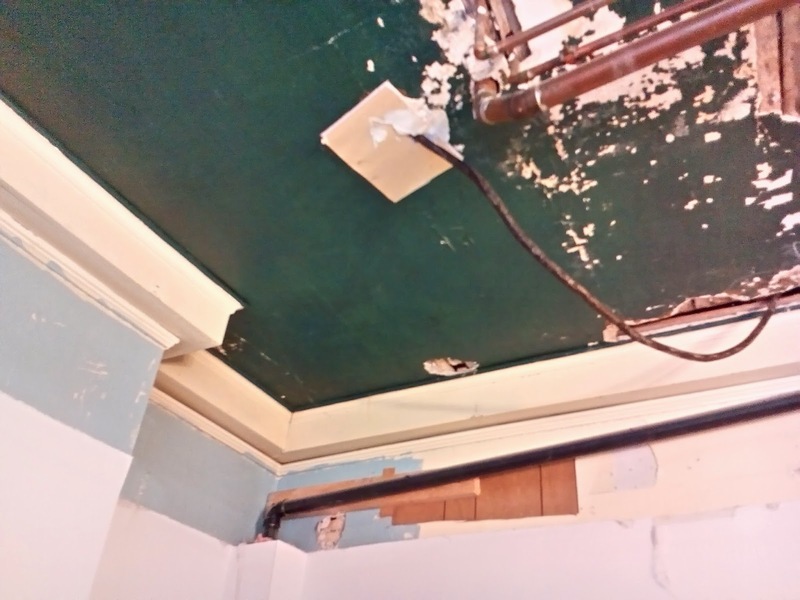 I'm thinking while we have the ceiling open then why not have our plumber replumb the pipes up into the ceiling cavity. Not sure it can be done, but maybe they can be placed higher up and then boxed into faux beams. 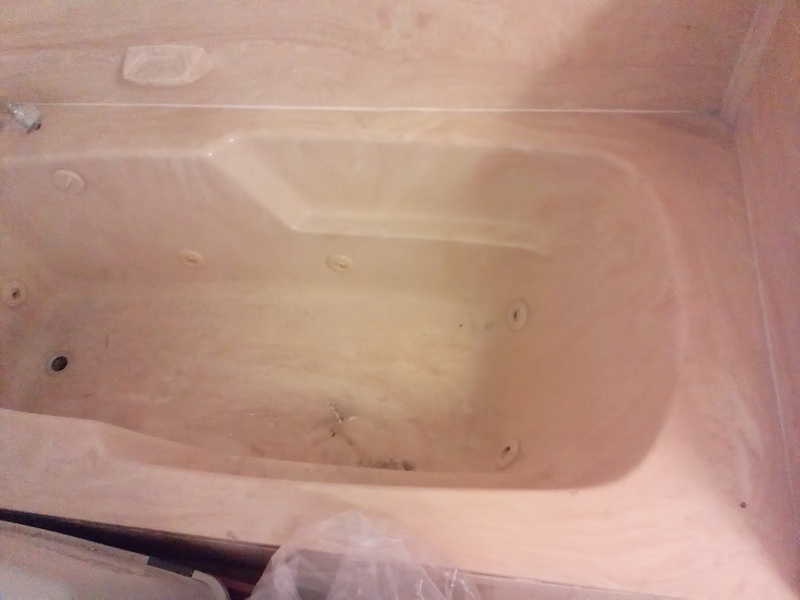 I am going to advertise this jet tub on Kijiji for sale cheap if they remove it. 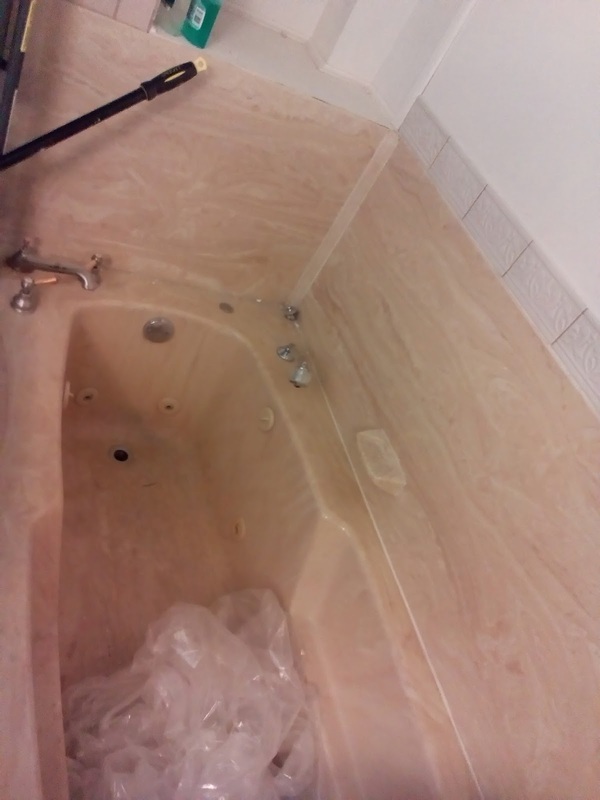 I can't use it and we want to put a shower in here that will be easier for my use. 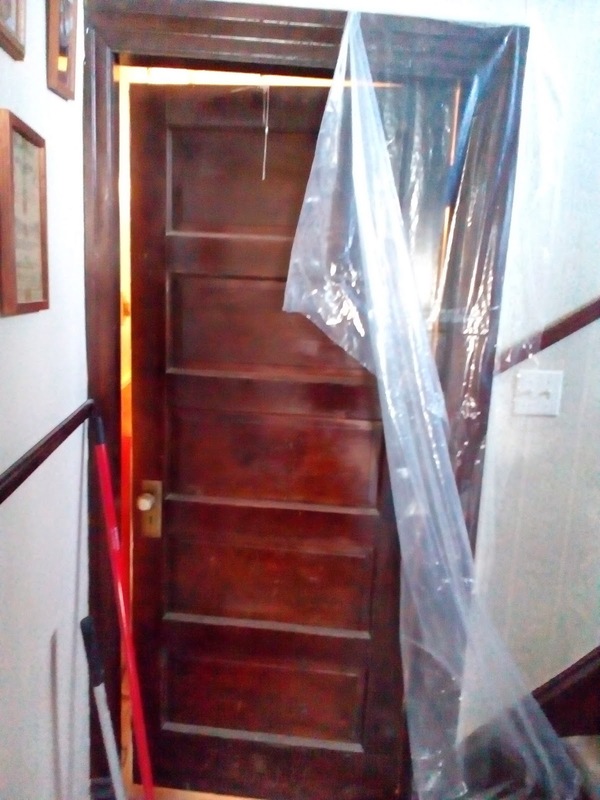 Remodeling a 100 year old house I want to retain its original character. 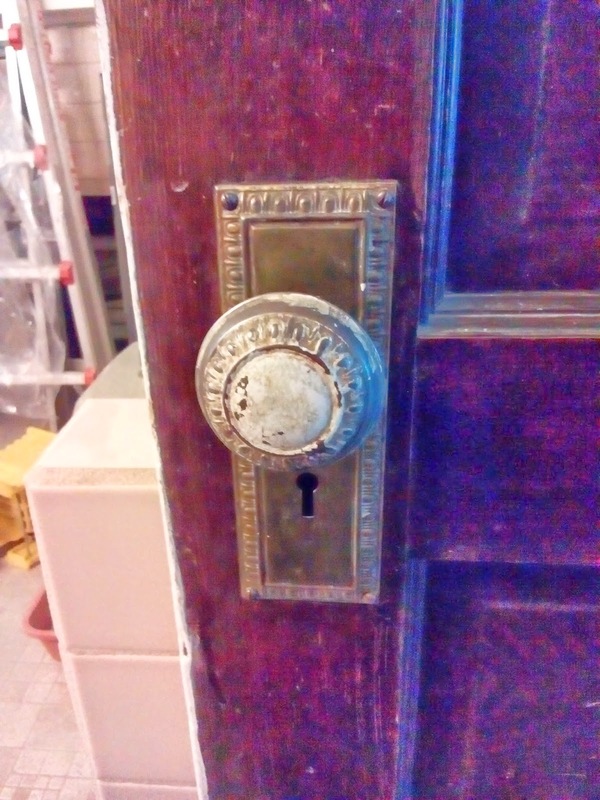 So I'm looking for doors like this for other parts of the house. Finding hardware like this is also hard. We need to clean paint of most of ours. So there we are, our renovation adventure continues. It has been a few weeks since I posted an update on our renovation. The kitchen is demolished as much as we want at this point in time. These next pictures were taken on February 17th. The bedroom above the kitchen has a sink in it so we did know there was more recent plumbing but had not idea that there was older drain pipes in the ceiling. Why were they never removed? At this point I could have cried. That is the top of the wall that separates the kitchen and the dinning room. The joists run front to back meeting above this wall and doubling up. From what we saw as we tore down mainly drywall from this wall, obviously the radiator upstairs was moved and to make that possible they cut right through a major floor joist leaving about two inches at the top. 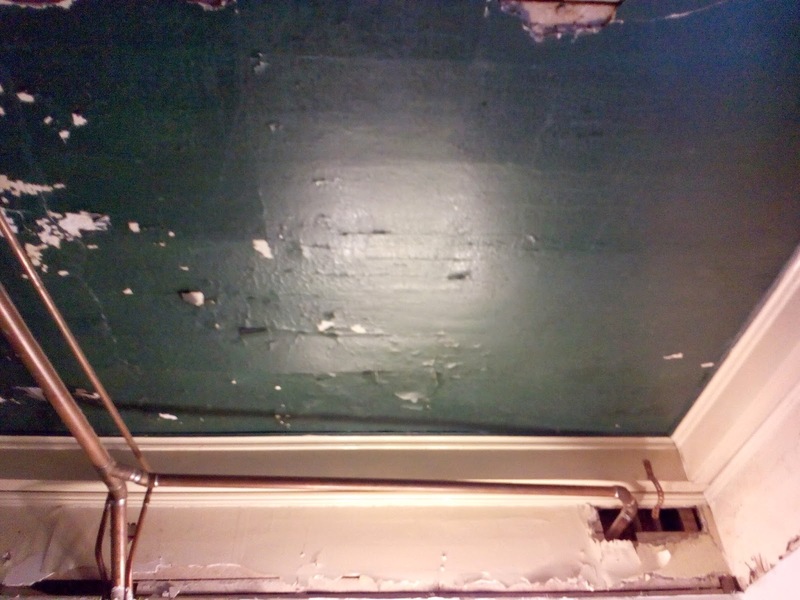 We don't want to take down the dinning room ceiling at this time, our question is: how do we fix this reinforcing that joist and the ones on either side? Richard was careful while pulling down the ceiling and it was a very good job. Near where he is working in the above picture he felt a pipe that was loose. 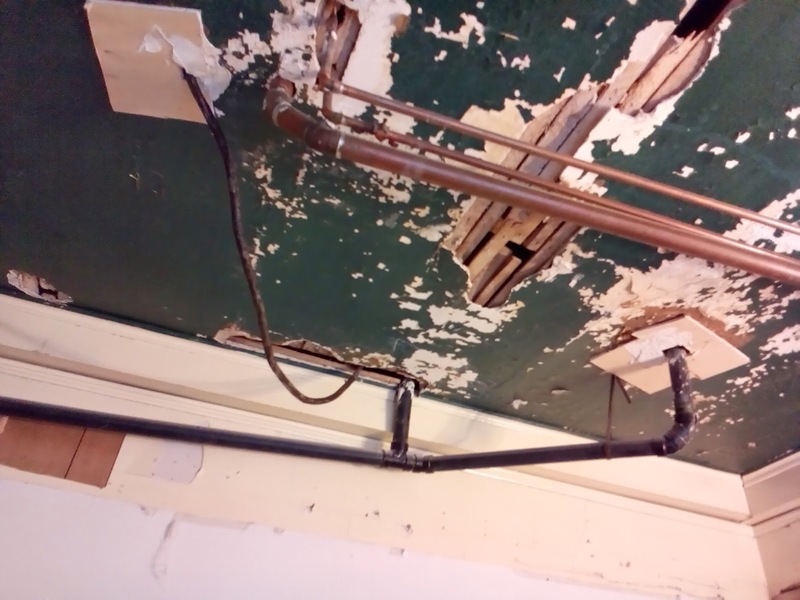 That is the loose pipe that he felt, if Richard had just ripped the ceiling down without taking care that eight foot piece of galvanized pipe would have come down on top of him. Again you have to ask; what were the people thinking when they left that in the ceiling? We covered all the cupboards and appliances with plastic the openings to all the other areas were covered with plastic. Even with all this care we were still left with a thick layer of dust everywhere. The dust is everywhere not quite as bad as this in the other parts of the house but we are still cleaning up. We can wipe surfaces down and by the end of the day there is another coating of dust. I can see why the DIY shows on TV move people out of their homes when they are doing this type of work. The dust is in every room and will take time to get rid of it all. The knob and tube wiring is live, some of the new wiring has been run from it, this means in all likely hood that the house was not rewired as we thought, indications in the basement were that someone had rewired the house. With the kitchen ceiling down we now know that there is still knob and tube probably through out our home and it will all need to be replaced. We decided we will not just cover everything up but will rewire. We will get the necessary permits and find an electrician who will over see Richards work, probably help, hopefully we do as little damage as possible in the rest of the house. Lots of work to do and very little free time to do said work. So I think we are living in this mess for some time to come. Pictures of the bathroom to come. Conservative Lutheran, Pastor's Wife, mother, grandmother(Nanny), cat lover, amputee and once more a reluctant employed person. May God in his mercy save me from a Christian Church where there are none but saints. I want to be with that little company, and in that Church where there are faint-hearted and weak people, the sick, and those who are aware of their sin, misery, and wretchedness, and feel it, and who cry to God without ceasing and sigh unto Him for comfort and help; and believe in the forgiveness of sins and suffer persecution for the Word's sake. Satan is a cunning rogue. Through his fanatics he seeks to make the simple-minded believe that the preaching of the Gospel is useless. The right approach is quite different.